Hybrid Thermosyphons – Arctic Foundations Inc. Hybrid thermosyphons are designed so that they can be cooled actively as well as passively. Active cooling means that some external energy must be expended to promote cooling - mechanical refrigeration is typically used. Most any of the thermosyphons manufactured by AFI can be built as hybrid units with the addition of an internal heat exchanger. A hybrid unit does not have to be actively cooled. The hybrid portion of the design might be to provide a higher redundancy factor over the life of the project. 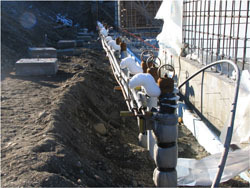 A typical application for hybrid thermosyphons is to accelerate construction on a project by active freezing. Hybrid thermosyphons were used to form a frozen barrier around a decommissioned settling pond in Oak Ridge, TN in 1997 to prevent contaminants from migrating out of the area. That system ran continuously from September 1997 until April 2004 when it was shut down to allow area-wide remediation. For purposes of contaminant control, the most recent and pertinent application was a demonstration project at the Oak Ridge National Laboratory, in which the HRE Reactor Pond was surrounded with a frozen barrier measuring 300' long, 12' wide, and 30' deep. The system was installed during the summer of 1997, and has been operating since August of that year. The data collected continuously since startup indicates that the system is functioning as planned. It is effectively stopping the flow of radionuclide contaminants from the pond and is doing so in a very cost effective, trouble-free manner.